Horning is an odd shaped parish in the North Norfolk district. It is located southwest of Ludham and northeast of Woodbastwick. The strange shape of the parish reflects the meandering of the River Bure. The village name also reflects the winding nature of the river at this point. It can be translated from Old English and means ‘the people at the bend’, referring to the bend of the river. Land in Horning is recorded in the Domesday Book as being held by St Benedict. Horning is also noted as the site of the abbey. 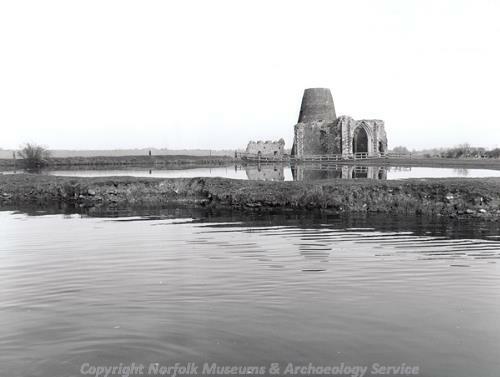 In fact St Benet’s Abbey (NHER 5199) is believed to have been founded in AD 800. To find evidence for earlier settlement and activity we have to turn to the archaeological records. The earliest archaeological finds are several examples of Neolithic flint axeheads (NHER 8416, 8418 and 8437). A Neolithic to Bronze Age axe hammer (NHER 8415) has also been recorded. The earliest monument is a probable Bronze Age ring ditch (NHER 36507). The cropmarks of this ring ditch and a possible burial pit in the centre of it can be seen on an aerial photograph. A Bronze Age metalworker’s hoard (NHER 8446) has also been recovered. This includes several copper alloy socketed axeheads, spearheads, a dirk, a bracelet and metal working debris. A Bronze Age socketed axehead (NHER 34944) and possibly part of another one have been found at another site. There are no Roman sites but several coins (NHER 8419, 14313, 20407 and 34941) and pieces of pottery (NHER 16036, 16270 and 34940) have been recovered. At one site the pottery included high status samian (NHER 34940). Brooches (NHER 25272, 32274 and 35280) have been found elsewhere. The figure of a bird with a long neck (NHER 8446) and a late Roman buckle (NHER 35892) are further evidence of activity in the area. A double ditch and bank (NHER 14099), now visible as a slight earthwork, is thought to be a linear earthwork or defensive barrier 40m across of possible Early Saxon date. This runs across a peninsula of land between the River Bure to the south and the River Ant to the north. This was first recorded in the 18th century, but was largely levelled by 1831. The Saxon foundation of St Benet’s Abbey (NHER 5199) dates to AD 800. Unfortunately there are no remains of this early religious centre although a Late Saxon runic inscription (NHER 5199) has been found here. The inscription is written in Scandinavian long-twig runes but has not yet been translated. The discovery of a Saxon spearhead (NHER 8442) in the River Bure reveals that life was not entirely peaceful. Other finds include pieces of Saxon pottery (NHER 34940 and 8446), a Middle to Late Saxon brooch (NHER 39636) and Late Saxon finds including a bridle fitting (NHER 35857), a Late Saxon strike-a-light handle and a stirrup strap mount (NHER 34464). The remains of St Benet’s Abbey on Cowholme Island (NHER 5199) date to the Benedictine foundation that was endowed here in 1020. Uniquely it was not dissolved in 1539 but was combined with the Bishopric of Norwich. The remains include a 14th century gatehouse encased in an 18th century windmill tower, parts of a precinct wall and ruins of a church. The church was extensively rebuilt in the 14th and 15th century. There are also earthworks of monastic buildings south of the church, an earlier monastic boundary and a series of elaborate fishponds. A range of monastic buildings on the edge of the river are being actively damaged by erosion. The abbey and windmill were a common subject for painters of the Norwich School. The Abbey was linked to the mainland by a causeway (NHER 5200) that ended at the medieval hospital of St James (NHER 8444). This provided care and welfare for pilgrims, travellers, and poor, aged and sick. The 14th century building on the site of the hospital may have been a chapel. A possible medieval quay (NHER 8443) on the island would also have provided communication to the outside world. St Benedict’s Church (NHER 8459) stands next to the possible Saxon defensive bank (NHER 14099) suggesting it may have been an important site at this time. The present building, however, mostly dates to the 14th and 15th century. The carved wooden benches inside the church are beautiful examples of medieval carving and the graffiti of a Gregorian chant is very rare and important. Another medieval building, The Ferry Inn (NHER 12522), was destroyed during World War Two killing 21 people but has since been rebuilt. The importance of the Abbey as a medieval place of pilgrimage is reflected in some of the medieval finds. These include two papal seals (NHER 20865 and 23725) that would have secured documents from the pope. Two ampullae (NHER 21716 and 32031), or lead pilgrim’s flasks, from Walsingham have also been found. A gold coin of Henry VI (NHER 20406) made between 1470 and 1471 has also been recorded. During the medieval and post medieval periods the cutting of peat from the valley was an important part of the local economy. Large broads and smaller peat cuttings (NHER 13751) can be seen along the length of the river. Drainage was also an issue. During the post medieval period many wind drainage pumps were constructed. Ferry Mill (NHER 23034) is a rare example of a smock mill pump and Hobbs Mill (NHER 19330) is the only open trestle wind pump with a scoop wheel in Britain. Wind pumps also still stand at Keeble Mill (NHER 5237) and St Benet’s Level Mill (NHER 8460). The sites of other drainage mills are marked on old maps (NHER 8458 and 14668). At one site two drainage post mills (NHER 15447) stood together. Several other post medieval buildings are also recorded in the database. Ivy House (NHER 43916) was built around 1700. Part of it is now used as a shop. The Old Rectory (NHER 42028) and Grove Farmhouse (NHER 43917) were both built in the early 19th century. The recreational use of the Broads from the early 20th century lead to an increase in the construction of boathouses, staithes and summerhouses. White Lodge Boathouse (NHER 35702) is an excellent example of this type of construction. Built in 1932 it has been linked to Arthur Ransome the author of ‘Swallows and Amazons’. The most recent archaeological sites date to World War Two. A spigot mortar base (NHER 24411), bombing decoy (NHER 28451) and air raid shelter (NHER 28937) have been recorded. Although there has been some local concern about the condition of the air raid shelter and the impression it makes on visitors it continues to be a rare and interesting example of World War Two architecture. Megan Dennis (NLA), 21 March 2006.
http://horning.the-norfolk-broads.co.uk/index.php. Accessed 21 March 2006.
http://www.edp24.co.uk/Content/Features/SpookyNorfolk/asp/EastNorfolk/FerryInn.asp. Accessed: 21 March 2006.
http://www.norfolkchurches.co.uk/horning/horning.htm. Accessed: 21 March 2006.
http://horning.the-norfolk-broads.co.uk/index.php. Accessed: 21 March 2006.
http://www.norfolkmills.co.uk/Windmills/horning-postmill.html. Accessed: 21 March 2006.